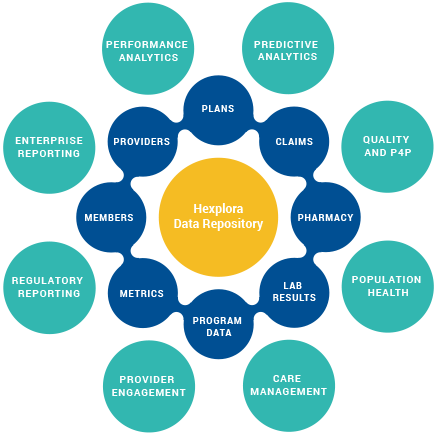 Hexplora.com is an innovative and cost effective end-to-end Data Warehousing, Business Intelligence and Analytical solutions to Healthcare industry particularly to Health Plans, ACOs, IPA’s with a focus on Medicare, Medicaid and Group insurance operations. Hexplora offers foundational EDW&BI platform for HealthCare organizations for their Analytics (Operational, Clinical, Financial, Performance & Predictive) and Reporting (Enterprise, Custom, Regulatory & Dash Boards) requirements. Hexplora solution is offered under Cloud based SaaS/BAaaS model (Software as a Service /Business Analytics as a Service) or as On-Premise project implementation on Customer IT infrastructure. Cloud based implementations are offered on Microsoft Azure Cloud platform.